While an 8th-gen Core processor upgrade is noteworthy, this is the third straight generation that Microsoft's Surface Pro has remained largely the same. Our review of Microsoft's Surface Pro 6 focuses even more than usual on the differences between this new generation and its predecessor, the Surface Pro (2017), because they seem nearly identical—at least on the, er, surface. 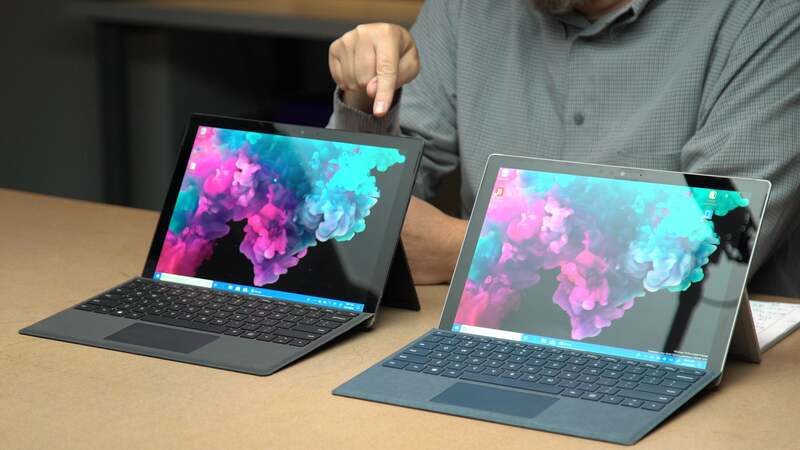 Visually, you'd be hard-pressed to differentiate the Surface Pro 6, the Surface Pro (2017), or the Surface Pro 4, all iterations on Microsoft's iconic 12.3-inch two-in-one PC. This time around, the major changes are inside: A bump up in the processor to an 8th-generation Core chip, some weird adjustments in pricing, and a new color— black—separate the new from the old. There's actually a downgrade of sorts in the GPU compared to the Surface Pro (2017), which is a bit of a disappointment. The Performance section of our review shows the clearest differences among the three generations. 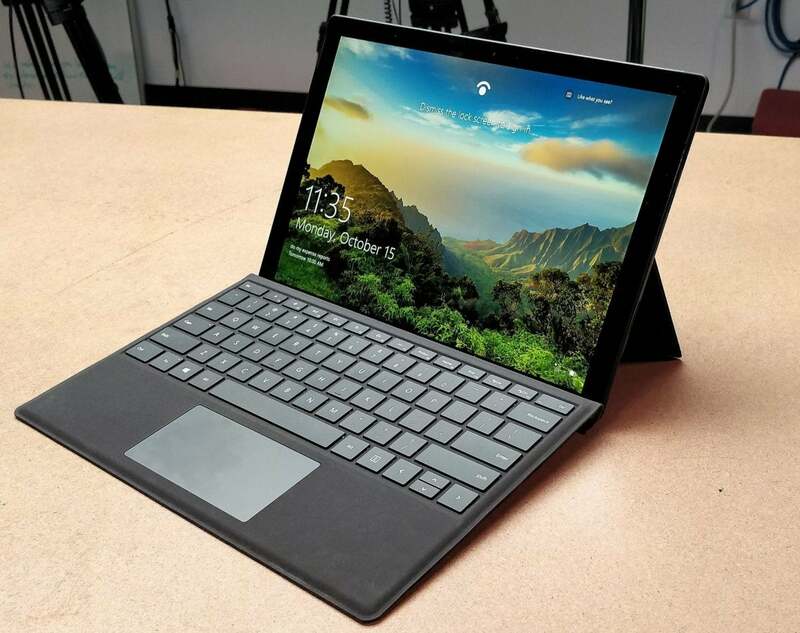 As you may recall from our hands-on with the Surface Pro 6 after Microsoft’s event, we discovered that Microsoft is selling both the Surface Pro 6 for Business, as well as the more generic Surface Pro 6 for consumers. The Business model begins at $999, rather than $899 for consumers. The additional $100 buys you a slightly more powerful Core i5 processor with vPro capabilities, an improved warranty with the ability to receive a new device before sending in the defective model (Advanced Exchange), and Windows 10 Pro, rather than Home. We reviewed the consumer version. Purchasing a Surface Pro 6 can be confusing—unnecessarily so, in our view. In addition to the $100 premium for selecting the Business edition over the consumer version, configuring your purchase feels a bit like a puzzle. Here’s an example: If you select the platinum Surface Pro 6, you can select a Core i5/8GB RAM/128GB SSD model for the minimum price of $899. But that same option is not available in black; instead you’ll be forced to upgrade slightly to a Core i5/8GB/256GB model, for $999. Would you like a Core i5 with a terabyte of storage? Sorry, you can’t right now. And so on. In choosing between the black and the platinum colors, consider how tarnished the platinum Surface Pro (2017) has become in a year or so of use, being shuttled back and forth to work in a backpack. You have two CPU options, period: a Core i5 and Core i7, and not the power-sipping Core m option of the Surface Pro (2017). The 7th-generation Core i7 chip powering the Surface Pro (2017) came with a powerful Iris Plus GPU attached. This time around, Microsoft’s returned to a more basic integrated graphics chip, the HD 620, on both the Core i5 and the Core i7. Then, of course, there’s the Type Cover, a virtual requirement for any useful work. Microsoft still hasn’t bundled the Type Cover with the Surface Pro, forcing you to pay an additional $129.99 to $159.99. The difference depends on the color you choose: black, burgundy, cobalt blue, and platinum. Ironically, a black Surface Pro 6 represents a slight premium of sorts, because of the configuration. 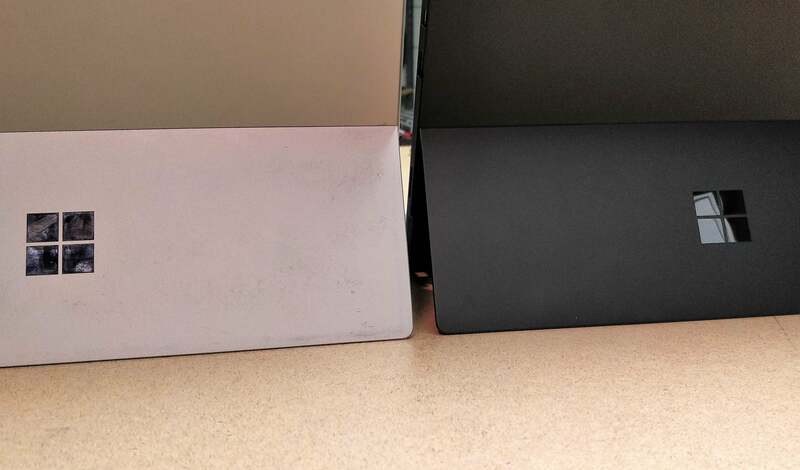 But the cheapest Type Cover is the black one, forcing true cheapskates to mix a platinum Surface Pro 6 with a black Type Cover to achieve the lowest price. All told, the “real” minimum price of the Surface Pro 6 is $899 for a platinum SP6 plus $129.99 for the black Type Cover, or $1,028.99. The $100 Surface Pen is truly optional. Compare it yourself to our review of the Surface Pro (2017): The new Surface Pro 6 is virtually identical in terms of dimensions down to the millimeter. We found it weighed almost exactly the same, with a bit of variance in our scale. Microsoft has made it available in two colors: the modern, traditional Surface platinum, and the new jet black, hearkening back to the first few generations of Surface devices. Like the Surface Pro 6, the tablet’s kickstand folds down about 165 degrees, nearly flat, for inking with the optional Surface Pen accessory. 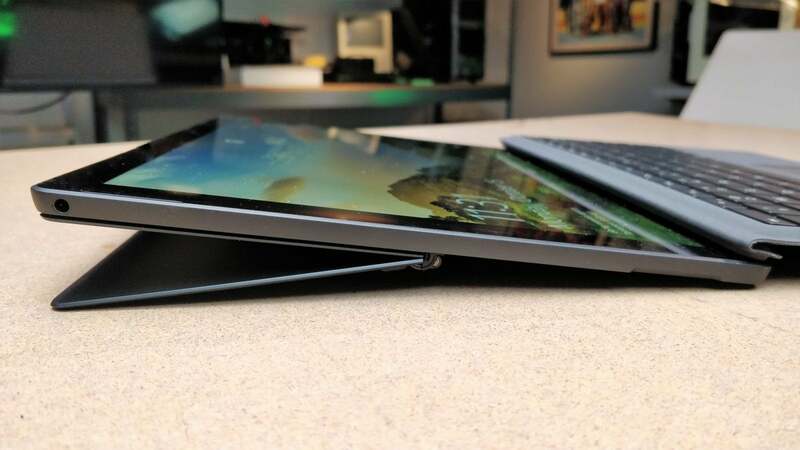 Microsoft doesn’t offer a Surface Laptop that folds back into tablet mode, so if you’re looking for a tablet experience with the structural rigidity of a laptop, you might look at our top pick for a convertible among our best laptop reviews. Folded down flat, the Surface Pro 6 is sturdy enough for drawing, though it’s more comfortable to detach the tablet and hold it while you ink notes. Remember, though, that the Microsoft Surface line begins and ends with its magnificent display: 12.3 inches (2736x1824), the same dimensions and resolution as its predecessor. Using Microsoft’s gorgeous new default background wallpaper as a guide, any differences between the Surface Pro (2017) display and the new Surface Pro 6 are slightly noticeable only in a side-by-side comparison. Our review unit pumped out 378 nits, 7 percent more than the SP (2017). At that luminance level, the SP6 is usable outside, though it’s best for high-contrast applications like Word. Like the 2017 model, the Surface Pro 6 features vibrant “enhanced” or more color-accurate “sRGB” color modes, and supports on-screen use of the Surface Dial for digital artists. We’re told Microsoft improved the internal cooling. The Core i5 model we tested was fanless (as was its 2017 predecessor), so we'd need to test the Core i7 version to gauge its fan behavior. Under some of the heavier benchmark loads—Handbrake, Cinebench and 3DMark—the upper rear of our fanless Surface Pro 6 became warm, but cooled off quickly. 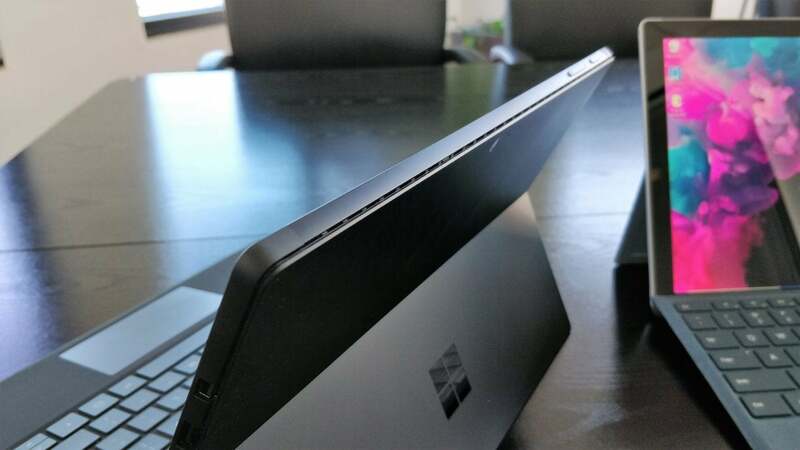 A row of recessed vents runs along the top and sides of the Surface Pro 6, funneling warm air out of the system surprisingly quickly. Microsoft’s product page claims the Surface Pro 6 uses the same sturdy magnesium unibody of the Surface Pro (2017), though it feels a bit more plasticky to the touch. Microsoft also eliminated the slight two-tone aesthetic at the top of the chassis that the Surface Pro (2017) used. There’s still the same slightly rounded corners (not as pronounced as on the Surface Go) and the same subtle venting at the rear. Finally, a small nitpick: The black-on-black approach made it a challenge to find the ports when using it within my dimly lit home workspace. Oh, and as for ports—no, there’s no USB-C, even though you'll find it on the Surface Go and Surface Book (and many other devices). Instead, there’s the standard complement of Surface Connector, MiniDisplayPort, USB 3.0 Type-A, and the microSD slot hidden under the kickstand. If you don’t own a Surface Dock, the lack of USB-C is a disappointing omission, as your expansion options are limited. Personally, this says yet again that we’re overdue for a new Surface Dock, either as a replacement to the current brick, or some more portable dongle that enables both power and I/O. The Surface Connector, USB-A, and a miniDisplayPort connector populate the right side of the Surface Pro 6 tablet. Microsoft didn’t update the existing Type Cover, which is interchangeable with those sold with the Surface Pro 4 and Surface Pro (2017), though not the Surface Go. The keys still feel a bit stiffer than I’d like. There does seem to be Alcantara fabric used in both the front and underside of the Type Cover, though it’s not as fuzzy as the other Type Covers I've used. I did notice a rather strong odor of polyurethane when I unboxed the Type Cover, something I hadn’t noticed previously. It faded fairly quickly. I have no concerns about the overall quality of the Type Covers, however. Because the Surface Pro tablets are often my testbeds for Windows Insider builds, I type on them for a few weeks straight at different times of the year, and they’re perfectly comfortable to use for long periods. The touchpad is equally functional. 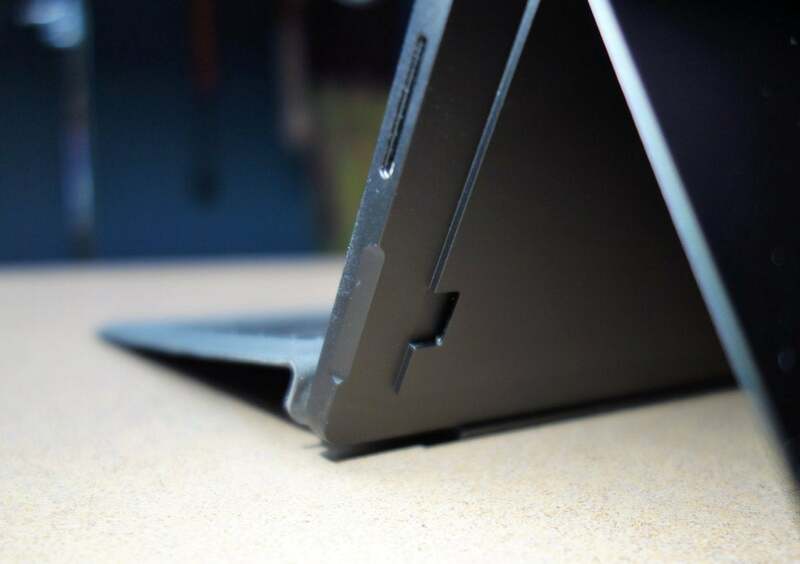 When used on the lap, the Surface Pro 6 grips the Type Cover securely, though it’s not foolproof. I do wish that Microsoft would steal some of Lenovo’s kickstand ideas, though. 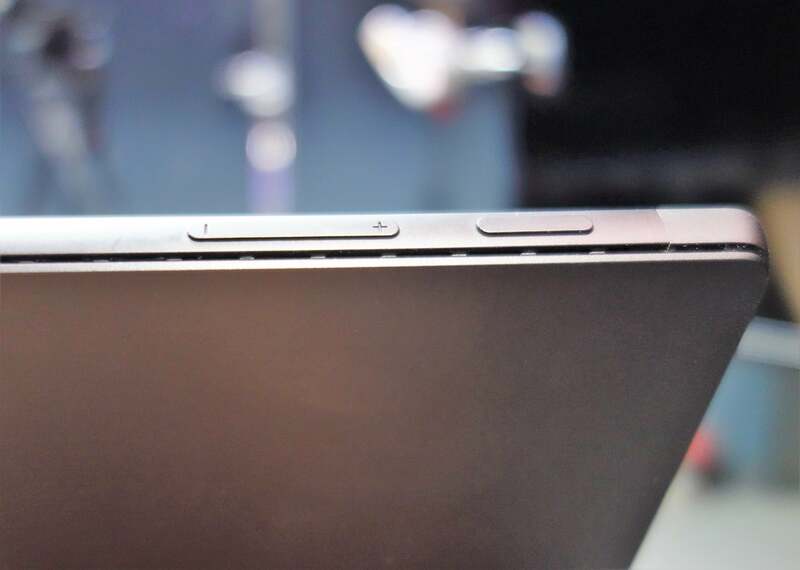 I'm a fan of the first-gen ThinkPad X1 Tablet kickstand that unfolded from the base, but also the more rounded downward-facing kickstand on its third-gen model, which feels less like a butter knife on your thighs. One traditional knock on Microsoft has been its follow-through: Having successfully established the Surface Pro, some of its engineering attention seems to have wandered elsewhere. Don’t forget about the microSD slot, which hides under the kickstand. The same goes for its camera. Others have experimented with ways to disable or cover the front-facing camera for privacy’s sake, yet Microsoft declined to follow suit—back to masking tape if you’re worried hackers may spy on you. Otherwise, though, the front-facing Windows Hello feature is as convenient and effective as ever, consistently recognizing me and logging me in. The rear-facing camera boasts auto-focus as well as HDR capabilities, but no flash. It does shoot 8MP photos, though only in a 4:3 format; the camera captures 6MP when capturing images in a 16:9 format. I thought I heard a slightly flatter sound the Surface Pro 6 speakers than from its predecessors, but I’m not certain. Microsoft omitted consumer-friendly details like Bang & Olufsen speakers (available on the excellent HP Spectre x2 tablet) and Dolby Audio (reserved for Microsoft’s Surface Book line) in favor of a downloadable Dolby Audio app or the built-in Windows Sonic audio processing for headphones. Oh, and don’t forget about the new Surface Headphones, too! 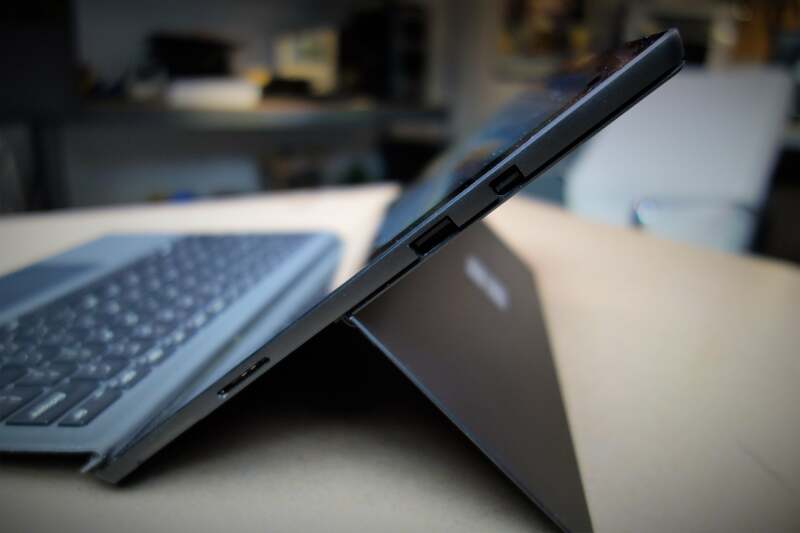 The power button and volume rocker of the Microsoft Surface Pro 6. We didn’t really test a Surface Pen (model 1776) that Microsoft shipped to us as an accompaniment, as we’ve used it before with the Surface Pro (2017). With 4,096 levels of pressure, it’s more sensitive than before, a distinction only artists will appreciate. The Surface Pro 6 may have changed little on the outside, but inside, Microsoft claims the new 8th-gen processor makes it 67 percent faster than the Surface Pro (2017). That’s a little complicated for us to measure. While the Surface Pro (2017) used dual-core 7th-gen mobile chips, the new Surface Pro 6 jumps to a quad-core, 8th-gen processor. But our Surface Pro (2017) review unit was powered by a Core i7 chip, and an Iris Pro GPU, while our review unit uses a Core i5 and ho-hum Intel HD 620 graphics. We’ve made sure to compare the Surface Pro 6 to its most potent rivals, including the Lenovo Miix 520 and ThinkPad X1 (3rd Gen) Tablet, as well as HP’s excellent, consumer-friendly Spectre X2. If you decide you’re looking for a thin-and-light notebook that flips back into “tablet” mode, consider our Editors’ Choice-winning HP Spectre x360 13t from late 2017, which is compared as well. 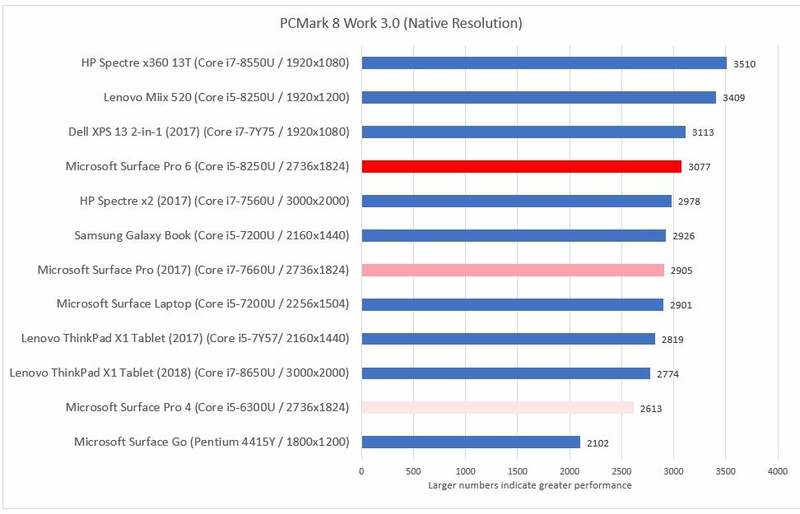 You’ll also notice three bars, shaded red and pink: we’ve called out the Surface Pro 4, Surface Pro (2017) and the Surface Pro 6 to better understand the generational improvements Microsoft has made. Microsoft has said time and again that the Surface emphasizes productivity, which we typically find embodied in PCMark’s Work, Home, and Creative tests. The Work tests tends to be the most commonly used, and what it measures—word processing, spreadsheets, and videoconferencing performance, among others—are usually pretty easy tasks for any modern tablet. Any score over 2,000 is good here, and all the Surface Pro generations easily surpass that. PCMark Work results tend to be tightly clustered, if only because many modern PCs can handle office tasks with aplomb. The Surface Pro 6 is no exception.